Should businesses track their search engine rankings? On the surface, it may seem like where a business’ site ranks in search results may ultimately determine its online success. Conventional wisdom would suggest that if a business ranks higher than their competitors for relevant search terms, then more people are likely to click their link, visit their page, and thus generate more business for that company. If it were that simple, this article would end right here. But it’s not. There’s certainly value in tracking search engine rankings, but let’s explore all of the reasons that rankings should not be the lone indicator of online or search engine success. By now, you likely know that Google constantly changes how it ranks web pages in its search results. Occasionally, Google will make major updates that change the rankings landscape – you may have heard the names Penguin, Possum, Panda. Cute animals, not-so-cute algorithm changes. Because of this, a website’s rankings can unpredictably change overnight without the site changing at all. Because of these changes in search results pages, there now exists more than one type of result, and each of these new features needs to be tracked in a slightly different manner. When a business or agency makes changes to a site for the purposes of improving exposure in search results, the changes are almost never immediate. In fact, they can often take weeks or months to bear fruit. We’ve written extensively on how long it takes to rank, but for this reason alone, anxiously checking rankings after a site update has been made can be a letdown in the short-run. Keyword intent is an important, and often overlooked, factor in choosing keywords to track. As a digital marketing agency, we may be inclined to focus on a keyword like “digital marketing,” but in doing so, we need to be careful to focus on keyword intent. As a business, we’re looking for searchers with transactional intent – those looking for “digital marketing services” or a “digital marketing agency in Cleveland.” We should be cautious of searchers with informational intent – those looking for “creating a digital marketing plan” or “free digital marketing tools.” Attracting searchers with informational intent can give businesses the opportunity to nurture those visitors to become customers in the future. If a business is very focused on ranking well for one keyword, for example “socks,” they are likely missing out on the big picture. Only 2.8% of searches these days focus on one-word keywords. By focusing on simply “socks,” your business is likely missing out on the numerous variations, such as “athletic socks”, “white socks”, “knit socks”, or “Nike basketball socks”. These are what we call long-tail keywords, and they make up the majority of search terms that people are using. 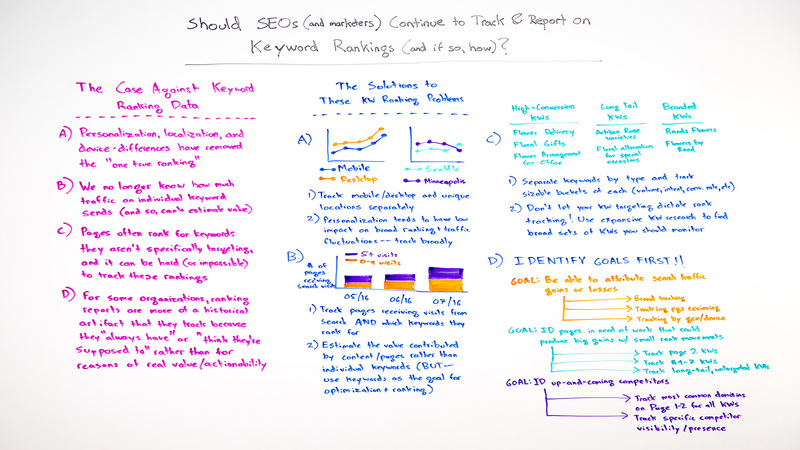 When looking at keyword rankings, we’re looking at where a certain page ranks for a certain keyword right now. If the sole focus of digital marketing efforts is to improve rankings, there are plenty of SEO tricks that can be used to try to influence the rankings in a certain page’s favor. But what happens when Google’s algorithm changes or the methods used previously are no longer effective? The focus, instead, should be on creating quality content that matches the searchers intent as best as possible. The focus should also be on creating the best user experience, focusing on design, site speed, mobile-friendliness. Let’s say your business is determined to improve its search engine rankings. You work as a team, or with an agency, and put together a list of 100 keywords that you want to rank for or improve your current ranking. Each month you focus on a group of those keywords, possibly 5-10 at a time. The problem here is that the other 90% of keywords that you’re not focusing on have the potential to move down in the rankings because you’re not producing fresh content around them, and you’re not optimizing your site around those keywords. Track as many keywords as you find value in tracking, just note that you will see natural fluctuations in rankings, and the movement won’t always go up. There are plenty of great tools that provide insight into a website’s search engine rankings for any number of specific keywords and pages. We use several excellent tools at Aztek. However, you’ll notice that if you view data from three different tools, you’re likely to get three slightly different results. The way these tools track search rankings differs, therefore it’s a good idea to consult multiple sources. Furthermore, if you’re looking at search results in your browser, say for example Google Chrome, you’re looking at a personalized set of results for you based on your location, browsing history, and a few other factors. Want to get ”true” search results? Go Incognito. Let’s pretend there are two websites. One ranks #3 for a specific search term, and one ranks #10. One would think the website in the #3 position is automatically going to receive the most traffic, leads, sales, etc. However, let’s not forget that the Title and Description have a lot to do with whether a searcher clicks or not. It’s true that higher search results receive a higher click-through rate. However, if one-out-of-ten searchers click the #3 ranking, and three-out-of-four click the #10 ranking, the latter actually performs better. And there’s an argument to be made that as #10 continues to have a better click-through rate, it will naturally move up the rankings as a result of begin a higher-quality link. So I shouldn’t track rankings? Let’s be clear, tracking rankings can still be a valuable activity and provide valuable information about the search engine market share and performance of your website. As a business, it’s important to evaluate or work with a partner agency what keywords you should be monitoring, why you’re monitoring them, and how you’re going to try to positive influence your rankings for those keywords. While rank tracking has many challenges, and by itself isn’t a perfect metric, e-commerce websites tend to be different. In the case of e-commerce websites, the difference between a page one ranking and a page two ranking can be a huge difference in revenue, especially for high volume search terms. Tracking keywords related to products and categories becomes more important. In addition, tracking special search features like Google Shopping results can be valuable. Organic traffic – This will show you how much traffic you’re receiving from search engines on an on-going basis. To make this really valuable, track organic traffic specifically tied to your high-value pages, and to pages that you’re working on optimizing. Domain Authority / Page Authority – These are metrics specifically from Moz, and other SEO tools have similar metrics, but they somewhat try to emulate Google’s PageRank, or the authority a site or page has. The higher the authority, the better the chance that a page will rank well compared to similar content or pages. User Behavior Metrics – Some of the indicators that are going to be important in Google’s analysis of quality content include click-through rate from a search engine results page, bounce rate from that page, and dwell time (or time on page). Look at these metrics to get an idea of how well your content resonates with the searchers intent. Not sure where to start with SEO and search rankings? Whether you’re concerned about your businesses search engine placements or need help navigating the complicated world of search engine optimization, Aztek can help. Contact us online or call us at 216-472-2121.